May 28, 2014 By Tara Nehil 4 Comments This post may contain affiliate links. Read my disclosure policy here. I’m so excited to be here at Mother’s Niche as a parenting contributor! Last August, my husband and I welcomed a beautiful baby girl into our lives, thus making us first time parents. 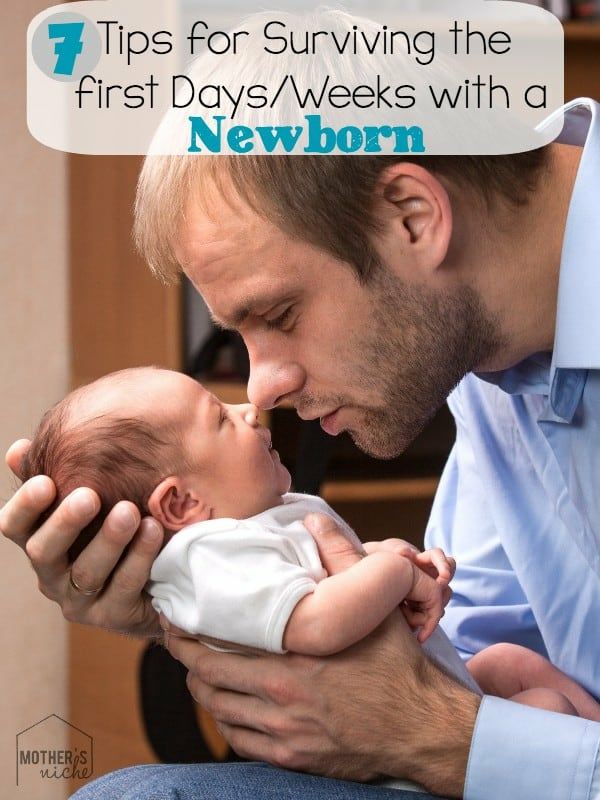 Today I’d like to share some tips and tricks we learned along the way to survive those confusing and frustrating, yet sweet, first days and weeks with a newborn. I hope they will help at least one family have some sanity, sleep or comfort! Accept Outside Food! If someone offers to bring you homemade food, say YES PLEASE! Feeding yourself and your family gets pushed low on the priority list once the little one is near. Take the food offered and you’ll have one less thing to plan. Accept Outside Help! If anyone offers to come over and help you do something, give it long consideration and accept! A friend or family member can hold/watch/walk the baby while you nap/shower/eat. They can put in a load of laundry or put the dishes in the dishwasher. 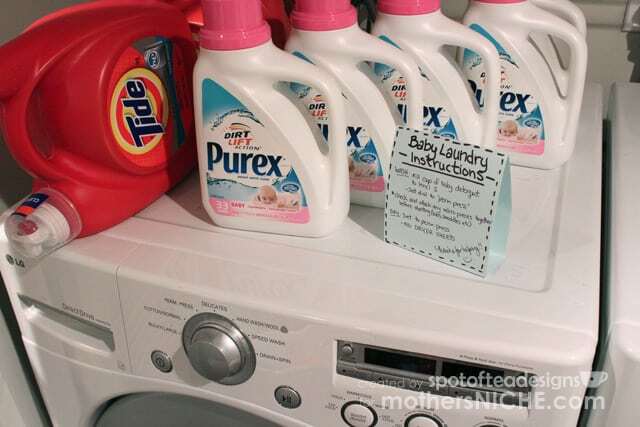 Tip: create a sign near your laundry on how you prefer to have it done so they don’t have to ask you a million questions but can follow what you’ve already outlined. Create Mini Routines! The first few days and weeks are anything but routine but there are simple things you can do to help kick off a good flow. Each morning before work, my husband would check out stock of diapers by the changing table, high protein snacks near my spot on the couch and check with me on our plans for dinner in case anything needed to be defrosted. At night, while he got her settled and ready for bed, I’d clean the bottles or pumping equipment and empty the garbage pail. Repeat the same steps each day or night so things are somewhat in your predicted order when needed. Go Hands Free! There were two items that came in handy A LOT those first few days/weeks and now months: a portable bassinette and a wearable baby carrier. I was able to put baby down in the bassinette and bring her into the bathroom to take a shower, in the kitchen to make food or near the computer when uploading her latest cute photos. 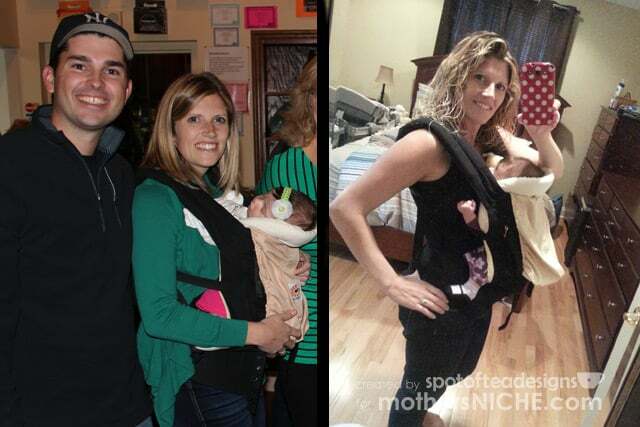 My husband and I both wore her in the baby carrier so we could have two hands to clean, go grocery shopping or hang out at a family function. Bonus: wearing babies also puts them to sleep! Get a Video Monitor! My daughter slept in a bassinette in our room the first six months, but we made use of the video monitor during daytime naps so I could get stuff done in the house. It’s now in full affect every night where she safely sleeps in her nursery. TIP: Get a second power cord for the monitor screen. While it does have a long battery life, in the case of the model we chose, if we left it plugged in, the screen would stay illuminated and I could easily glance over at the screen from across the room. Without being plugged in, the screen shuts off to save battery life and I’d always wonder if that little whimper was a cute dream or a call for mom. Send Dad to bed early! While I stayed home taking care of our daughter, my husband continued to work a full time job. In the first few weeks, after dinner, I’d send him to bed, even if it was 7pm! If I needed him to take a turn with the baby at midnight, I knew he already had 5 good hours and could get more after she was back to sleep. Free Breast Pump. If you haven’t already ordered a breast pump, get one for free and avoid the paperwork with your insurance company with the tips in our free breast pump with insurance article. If you have any basic tips on newborn life for other expecting parents, leave me a comment! If you’re looking for more parenting advice, check out my first time mom advice series at my blog Spot of Tea Designs! I'm a born and breed Jersey girl who's been creative all my life! After going to school for graphic design and working in the web and marketing fields, I now juggle freelance work from home while being a new wife and first time mom. My blog, spotofteadesigns.com, chronicles the creative parts of my life along with my take on raising our little girl. Visit my blog to find crafts, DIY projects, attempts at baking, real life party planning, designing and advice from a first time mom. Timely post for me as I am helping my daughter with her daughter who was born Saturday at 37 weeks. Congrats on your new arrival Holly! Hope these tips are helpful for you and your daughter! I have three children, my third being 9 weeks old. Your tips are wonderful! My first tip is that one of the most useful items I found with all my babies was an Angelcare moniter. It has a sensory mat that you place under the baby’s mattress and sends out an alarm if there has been no movement after 15 seconds. For me, this put my mind at ease as cot death is something very real in today’s world and it is difficult to see if a baby is breathing over the video screen so saves checking on baby! Second tip is for breastfeeding I drink malt drinks twice a day and this keeps my supply bountiful! Third tip is be good to yourself! Eat good food drink lots of water and leave the housework. It will get done eventually and you have the rest of your life to do it, the world wont stop if the floor is dirty or if there are dirty dishes. Second part of this tip is buy disposable plates!! They are invaluable for the first few weeks if you cant keep on top of dishes. Final and most important tip is TALK..if you feel like you are being swamped ASK for help. There is always someone whether its your Mom, your cousin or even your neighbour that can watch baby for an hour if you need to sleep/need some time out. Parenting is the best job in the world but sometimes we like to think that we are Supermom and can do it all when really sometimes we need to be looked after. Talk to someone if your struggling or if you have feelings of not being able to cope, its so important. Even sharing your worries or feelings with your partner can help and if they are too busy or if family/friends are not close by/available there are wonderful mothering forums and hotlines that Moms can avail of to chat/unload worries. We are all in the same boat, no matter what walk of life we come from or where we live, we are all Moms and we all at some point or another have the same worries. Your not alone, because somewhere in the world someone is going through the exact same thing! The most important tip of all is to enjoy every moment you can with your newborn as it goes by in the blink of an eye. I truly believe there is some time warp when you have children – it goes by faster because that’s what time does when your enjoying yourself.